FULTON, NY – Carolyn Handville, program coordinator for Oswego County Opportunities’ Cancer Services Program Partnership, has announced that Dr Padma Ram Medical Services, LLC, in Oswego is the newest member of the partnership and joins the Cancer Services Program’s network of more than 25 health care provider offices throughout Oswego County. Oswego County Opportunities’ Cancer Services Program Partnership recently welcomed Dr Padma Ram Medical Services in Oswego as a new provider within their network of more than 25 health care provider offices throughout Oswego County. From left are: Terry Salmonsen FNP, Danielle Mulcahey LPN, Karen Scaff MBA, Padma Ram MD, Carolyn Handville CSP Coordinator, Tara Stoddard CMA and Jasmine Whitfield CMA. Dr Padma Ram Medical Services, LLC has opened a brand new, full-service health care building located at 300 State Route 104 East. The facility is equipped with prompt care, a blood draw lab, an imaging practice as well as general care. With the combination of compassion, expertise, and commitment, the highly skilled staff Dr Padma Ram Medical Services, LLC is dedicated to providing outstanding services to their patients. OCO’s Cancer Services Program provides free cancer screenings including clinical breast exams, mammograms, pap/pelvic exams, and colon cancer screenings to uninsured women ages 40 to 64, uninsured men ages 50 to 64, and uninsured or underinsured women under 40 years of age who are at risk of, or have had a clinically significant finding for, breast cancer. 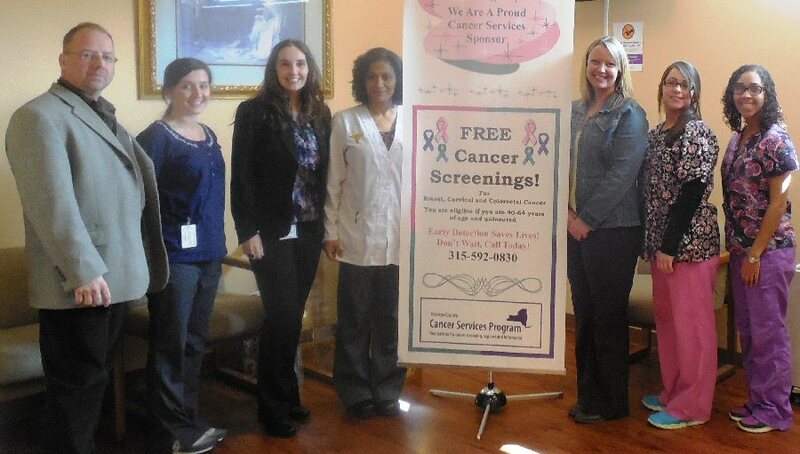 For more information or to schedule an appointment, contact the Cancer Services Program at 315-592-0830.